The outing will be to the Bovlei area of Wellington, where we hope to visit 5 homesteads. Wine tasting is also available on this trip. VASSA has not had an outing to this area for many years. We will start at Welvanpas Estate. John Rennie is a well-known Cape Town heritage architect and a former Chair of the Vernacular Architecture Society. His practice, Rennie Scurr Adendorff Architects, has won a number of awards for its heritage projects. He has been active in the Society from its earliest days and has led many outings and spoken on the subject of our vernacular heritage on several occasions. Travel through Wellington and take the road up towards Bainskloof. You will pass the Bovlei Wine co-op on the right, turn off left almost immediately after the co-op and keep right when the road forks; at the next intersection turn right again and keep travelling (the road changes from tar to gravel) till you get to Welvanpas at the end of the road. (Allow about 1 hour to get there). You will pass Klein Optenhorst (a landmark for those of you who may have visited this lovely garden on open days) on the way. Welvanpas, is the ancestral home of the Retief family. We will not be able to see the inside of the farmhouse, but we will be able to look around the werf at the other buildings. There is a small coffee shop in the old mill at Welvanpas, and those who get there early may like to enjoy a cup of coffee before we start. Our hosts will be Dan and Retha Retief. After Welvanpas we will stop briefly at Nabygelegen nearby which is owned by Mr James MacKenzie. Here wine tasting will be available and Mr Mackenzie will take us on a cellar tour to show the restorations done to the old cellar. From Nabygelegen we will travel to the Bosman Family Vineyards ( www.bosmanwines.com) where we will be able to have our picnics either on the lawns or in the old cellar. Wine tasting will be available in the restored old cellar. For those who don’t want to picnic and/or taste wine, try the Twisted Kitchen restaurant which is situated close by in Hexberg Road, Wellington. (http://www.twistsomemore.com/) (Tel: 021-8641467) as is the boutique hotel Au’ de hex: http://audehex.co.za/ both of which offer lunch. If you choose either of these options, please pre-order your lunch so as not to delay the start of our afternoon outing. The Lelienfontein Estate, originally allocated to the Huguenot, Philip de Royan in 1699 by Governor, Willem Adriaan van der Stel, was settled by the first generation of the Bosman family in 1798. The family’s first ancestor, Hermanus Bosman, was a sieketrooster (caregiver) who worked in the Cape and played a central role in community development and social upliftment..
Welvanpas was originally called De Krakeelhoek. It was granted in 1712 to the Huguenot Pierre Mouy who had been settled there since 1705. It was acquired by Jacobus Retief in 1784 although there was a connection to the original owner since Mouy’s daughter had married Francois Retief in 1700. In 1817 Retief demolished the old house and built a new one behind it, higher up the slope. From Fransen we learn that, according to the late Dan Retief, great grandson of Jacobus Retief, the latter had a slave who designed and built houses. He built Welvanpas, possibly also Nabygelegen and Weltevreden near Stellenbosch. The outbuildings are grouped around the forecourt and stand parallel with the front of the house. Nabygelegen was granted to Arnoldus Kreutzmann in 1712. In 1807 it was bought by David Gerhard Roux. The gables were clipped in the late 19th century and the veranda added. The cellar is to the left of the house and has a triangular gable with a pseudo-pediment (Fransen) and round-headed windows, all dating from about 1840. This farm was a deduction from Groenfontein, made in 1839. The H-shaped homestead had been modernised, with loft windows but retains its thatch roof. The neoclassical gable (dated 1795) is a fairly recent addition. This farm is a deduction, nearly 7 morgen in size, from Optenhorst made in 1812 after the death of the Widow Jan le Roux for her son Gabriel Hauptfleisch. Possibly the name, which means hesitation or doubt, refers to the fact that it was doubtful whether one could farm such a small piece of land! The homestead dated 1818 is, according to Fransen, ‘one of the most interesting and best preserved houses in the Bovlei, though of course it has not been left unaltered’. It is H-shaped with no back gable. The house has a neoclassical gable. The façade is also very interesting with fluted pilasters flanking the front door and a classical architrave. 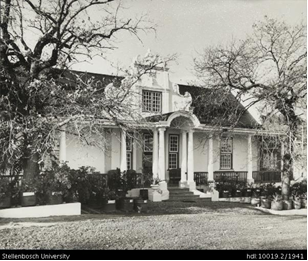 The veranda with its central portico is attributed to the Paarl architect Wynand Louw c. 1920. An outbuilding beside the house with a gable dated 1824, with four pilasters, pediment and wings without scrolls, is possibly an older house.